Based on an ancient Indian system of holistic health, Ayurveda is one of the most natural ways we can look after our mind and body. 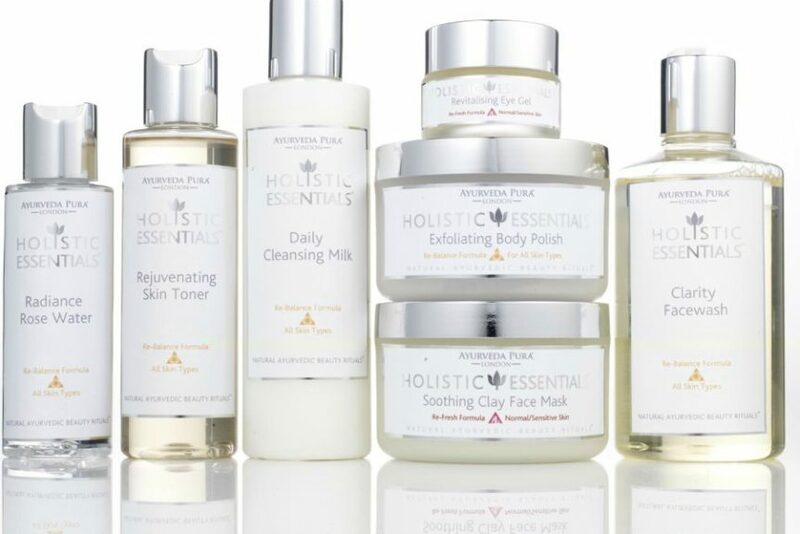 Holistic Essentials, an Ayurveda skincare range by Ayurveda Pura, is created to suit every skin type and is free from animal testing, perfumes, SLS and parabens. -Re-Energise Cleansing Milk: Give your skin a zingy wake-up call with this re-energizing cleansing milk brimming with Juniper Berry, Geranium and Mandarin essential oils to help tone and cleanse your skin. -Re-Fresh Exfoliating Cream: Boost your skin circulation and bring a healthy glow to your complexion with this nourishing exfoliating cream packed full of Jojoba oil and essential oils of Orange, Neroli and Rose. -Rejuventing Skin Toner: The perfect accompaniment to your skincare routine, this light and uplifting toner with Floral Water, Ginseng and Aloe Vera is gentle for the skin and helps brighten and tone your complexion. –Anti-Ageing Face Cream: This luxurious face cream is packed full of a rich blend of Sunflower, Apricot Kernel, Kiwi and Asparagus Root extract AND Neroli, Lemon and Frankincense essential oils to help moisturise and replenish the skin. -Rejuvenating Eye Gel: Don’t forget to treat your eyes to this rejuvenating eye gel which contains a unique blend of Witch Hazel and Frangipani, Lemon and Mandaring essential oils designed to nourish this sensitive area.